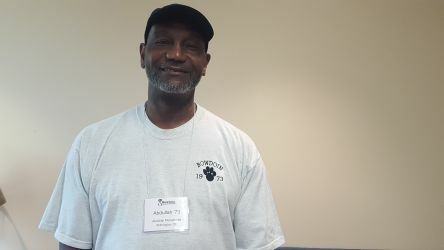 Abdullah Muhammad (Class of 1973) discusses his decision to attend Bowdoin, his on-campus activism, and his involvement with the John Brown Russwurm African American Center. He describes his role as the creator of the Center’s library, as well as his broader position as the Center’s house manager. Muhammad also recounts a specific instance of protest, which occurred in response to the College’s administration reneging on their promise to ensure that at least 10% of an admitted class was African American. He tells of how his passion for activism inspired his studies in government and English, and finishes with several pieces of advice for current and future Bowdoin students. Muhammad, Abdullah, "Interview with Abdullah Muhammad (Class of 1973) by Ben Bousquet" (2018). Alumni Oral Histories. 4.